Portion Control – What Does 30g Carbs Look Like? If you are worried about keto portion control – what does 30g carbs look like? For anyone who is keto, this 30g will exceed your daily allowance. For many of you, especially if you are a low-carb beginner, will be shocked to see how many carbs are in everyday foods. Read on to learn how to cut back, how to start, and what to enjoy. How many carbs should you enjoy each day? 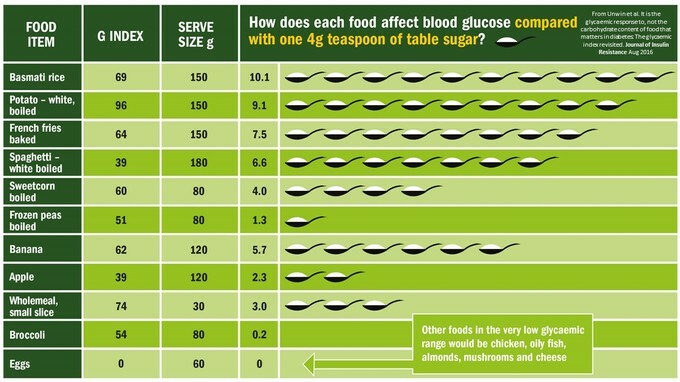 How do everyday carbs affect your blood sugars? Portion Control – how many carbs should you enjoy each day? There are no official guidelines, but most consider the following levels of low-carb and their carb limits. MODERATE LOW-CARB – less than 100g net carbs per day – even reducing carbs (especially ultra-processed junk carbs) has many health benefits. So how many carbs should YOU be enjoying each day? It all depends on where you are now. Are you hooked on junk food and sugar? Are you insulin resistant? 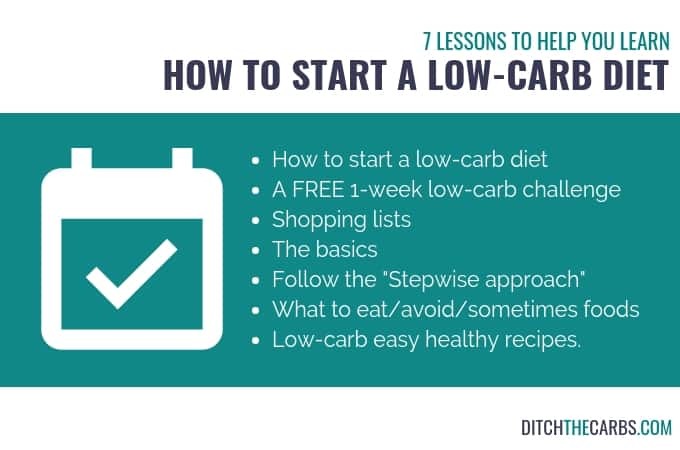 If yes, then you may want to go stepwise and begin by simply reducing your carbs, to begin with. It also depends on your health conditions and health goals. Those of you who are overweight and have blood sugar control issues may want to have a different level of carbohydrate restriction to those who are in the healthy weight range, active and are insulin sensitive. 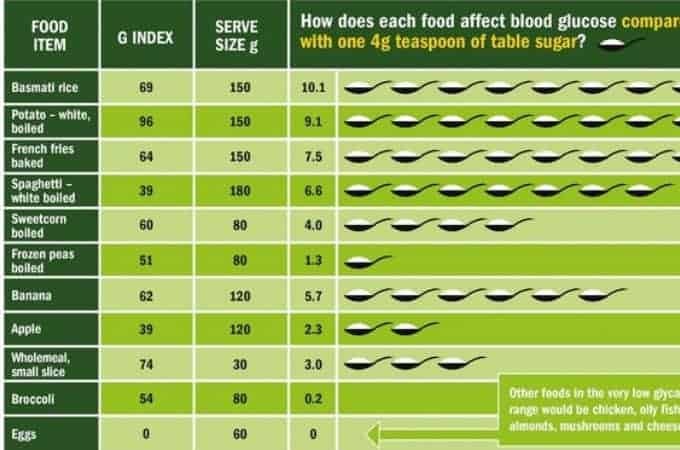 If you have ever wondered what everyday foods do to your blood sugars, just take a look at the charts below. 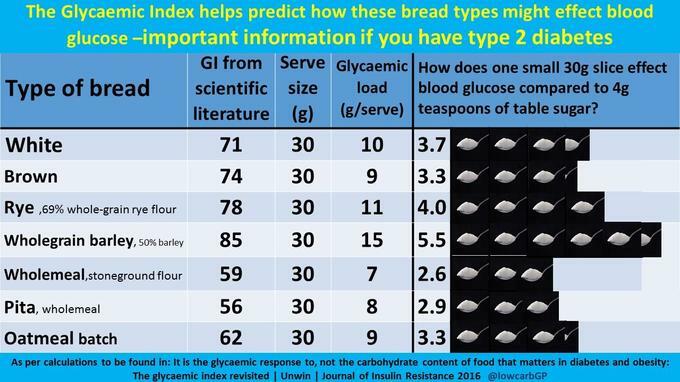 You probably understand that sugar and candy raise blood sugars, but what about wholegrain bread? Porridge? Brown rice? 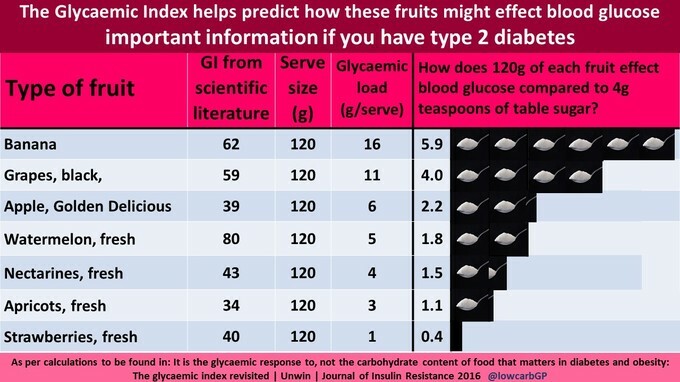 Once you understand that ALL digestible carbohydrates (so that doesn’t include insoluble fibre) are turned into sugar in the blood, you will realise how many daily foods – yes, even the healthy whole grains – impact our sugar levels which results in many of us to have chronic high blood sugars without realising it. To see all the infographics – CLICK HERE. 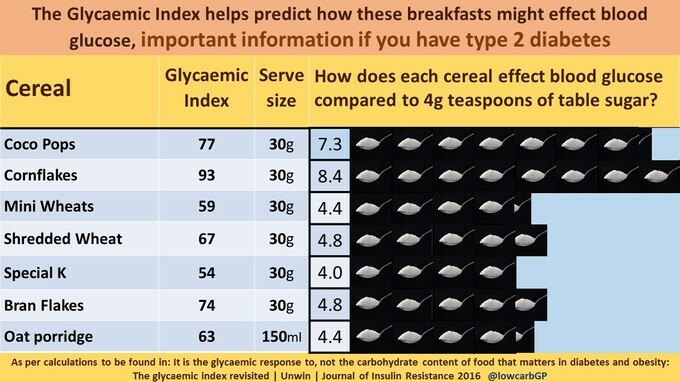 When you realise how high carb so many foods are, you can easily see which foods to avoid, and which foods are better to enjoy. Who wants 0.8 of a pancake or 1.8 dates (which are sugar bombs BTW) when instead you could have 69 cups of spinach or 60 medium eggs? 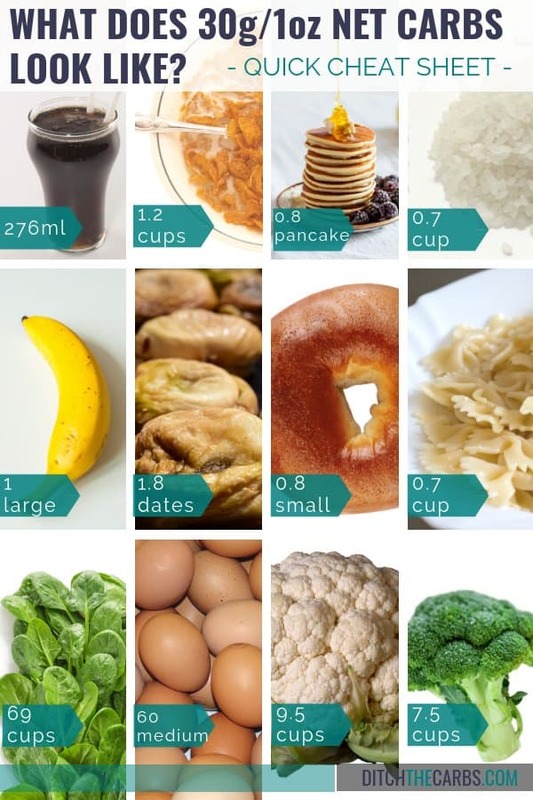 Now, I’m not saying you would want to eat 69 cups of spinach, but this handy carbs in food chart is simply to guide you to make better choices and better portion control. The high-carb junk food shown has almost no nutritional value, they give you empty calories and adds to the chronic high blood sugars that so many people live with day in, day out. Now look at the nutrient dense low-carb foods along the bottom row, and you can easily see how you could have a filling nutritious meal AND stable blood sugars. Each meal you enjoy that is low-carb nutrient dense, crowds out the junk food from your day. There is no good sugar, grain or starchy diet. Seriously. The CDC recently stated that 12 percent of Americans have a normal metabolic system. That means 88 percent of Americans have some kind of metabolic derangement. I’d say that as long as sugar, grains, starches are promoted we will continue driving our population into insulin resistance and Diabetes will continue to grow in our sick society. Booooooooooooooo. Carbs are necessary. Many people have adverse side effects to keto. Concentrate on active living more than how many carbs. You cannot run yourself out of a bad diet. BMJ article. Athletic- it’s not a NO carb diet- it’s a low carb SELECTIVE carb diet. No one is saying that carbs aren’t necessary….but, carbs are not essential to life. Essential fatty acids and Essential amino acids are. There are no essential carbs. But in order to enjoy and be healthy- plant carbs are included on a low carb or keto diet. Many people have adverse side effects to the Standard American Diet– like disease. So Boooooo somewhere else. there is no essential carb. Not one. The body needs three things….essential amino acids (protein), essential fatty acids (fat) and 1 tsp of glucose which can be made by the liver via the process called Gluconeogenesis (from eating protein). Carbs are NOT necessary what so ever. 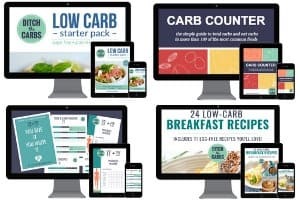 I would love to have you show what 30 g of carbs looks like in a single day’s low carb menu looks like, too.